Don’t lie—there are times when you look around at the sea of toys littering your home, the clutter brought in by your spouse and (to a lesser extent of course) yourself and think “you know what? Whatever.” You’re tempted to just let it all sit out, to let your home grow into one of those scary hoarder nests that you see on television…or would if you could find your television under all of the mess. Here’s the thing: as fruitless as it can feel, cleaning up the clutter can actually help you reduce your stress. One of the first things that psychologists will recommend to people who are in the early stages of depression is to clean their homes. Getting rid of clutter and dirt helps get rid of existential angst as well. Because when you look around at all of it, you feel weighted down by the size of the project. The sheer volume of cleaning that waits for you can be enough to make you want to run away from it. Suddenly you feel like you can’t do anything—you don’t want to have people over because you don’t want them to see. You don’t want to go out because you feel like going out while the house is dirty is akin to slacking on chores. So you need to clean it up. Moreover, you need to clean it up in such a way that it stays (at least mostly) clean. How do you do that? If you live in someplace that has seasons, you’re already a step ahead of the game. Simply take everything “off season” and put it away in your attic or basement (or storage unit if space is limited). I live in Phoenix where we have basically one season: hot. This makes it harder to justify things like putting away pool toys in October or insisting that you don’t need to break out the flip flops until June. Moreover, in Phoenix we don’t typically have attics or basements so there really isn’t anywhere to store things that feels truly out of the way. I went through my house room by room and actually picked up and held/touched every single thing in them. The touching is important because we tend to gloss over and not see the things we’re used to seeing every day. Touching everything forced me to really look at and pay attention to everything I own. My criteria for keeping something was pretty simple: If someone in the family hadn’t used it in the last twelve months and it wasn’t something in good shape that could be grown into, out it went. My local Goodwill loves me now. Pro Tip: You can also sell off the things you decide to get rid of on eBay or Craigslist or in a yard sale for extra cash. 3. We only use this a couple of times a year/we aren’t currently using this but one of the kids could grow into it. Group One got to stay exactly where it was. That was easy enough. The second group got packed up into decorative boxes and tins and stashed in the tops of closets, under beds, etc. The third group required some extra work. Remember: we don’t have an attic or basement and our garage isn’t weatherproofed to my satisfaction so I decided to rent a storage unit. Phoenix storage units, it turns out, are incredibly affordable. I used Storage.com to find a unit that was the right size, price and conveniently located. Everything in the third group got packed up and stored there. Oh, and I made sure that when I was looking for Phoenix storage spaces I narrowed down my search to those that were climate controlled. Things like that are important when you live in the desert. I have given up on even the idea of trying to corral the kids’ toys to one centralized location. Instead, what I’ve done is put big (pretty and decorative) crates in each room. Whatever is strewn out in that room, goes into that room’s box. This makes “pick up your toys” much less of a hassle for everyone. With everything else, though, I’m ruthless. My spouse and I are more than capable of cleaning up our clutter. We aren’t thrilled about it when we’re tired but we both enjoy having the majority of our evenings and weekends back. 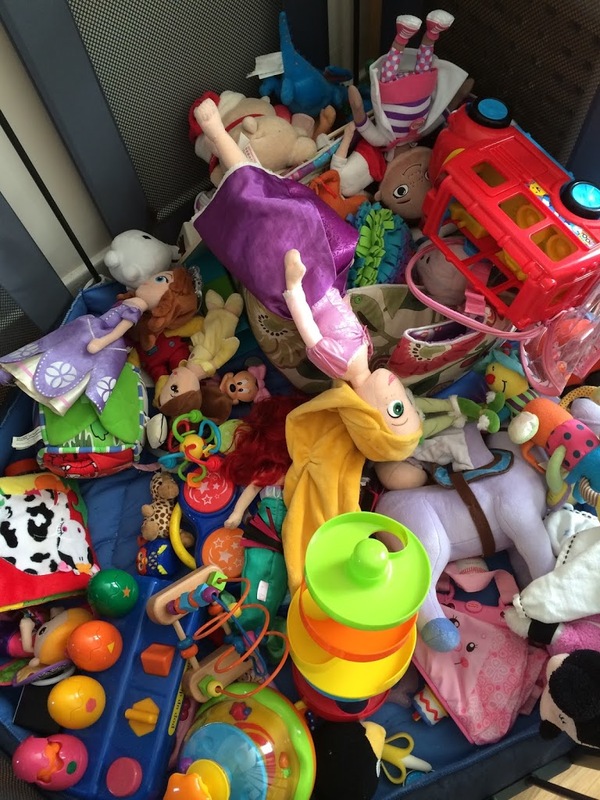 Have you found a way to corral your clutter and keep the “toy carpet” in check? Tell us about it! Disclaimer:- This is a featured post – see my disclosure policy for more details.